Yesterday was my 16th wedding anniversary. Yesterday, I wanted to strangle my husband. Ok, hold on, don’t send for “the Po Po” just yet (and for those of you who don’t speak 10 year old – “the Police”). Contrary to what you might be thinking, it is not because he had not gotten me a gift (which he hadn’t) or card (again, nope) but because he promised a favor. You see, my husband is one of those good guys. Therefore when our elderly neighbor asked my husband to drive her 2 hours to the airport to meet and pick up her adult son and then drive them the 2 hours back, he, of course, agreed. However, at the moment of acquiescing, he did not realize two things. One, the day in question was our anniversary and two, he would be called to one of those can’t-miss-on-penalty-of-death type meetings. So, I guess you are thinking I was ready to commit husband strangulation because he forgot our anniversary. But, the truth is, I forgot too. No, what got my undies all in a bundle was the fact that now, in light of the meeting, his saintly gesture to our neighbor now fell to me to execute and well, I am just not that saintly. Nonetheless, execute I did! Really, I am not as big a twirp as I sound. At the time agreed, I met my neighbor with a smile, assured her it was no big deal when she thanked me on the outset of our trip and declared me over-the-top neighborly (ha, if she only knew). Then, we opted for silence. We arrived right on schedule… 40 min before the flight arrived. We parked and waited at the gate for arrival. With my neighbors son in tow, we slowly walked to baggage claim, waited, and then slowly back to the parked car. I paused for them at the crosswalk while a pair of turtles hurried past (ok, she has an excuse – at 90 you are allowed to walk any speed you want and I guess he was just tired). On the 2 hour eternity ride home, we played more telephone. But after my best sorority-girl conversation starters fell like a drunk man off a roof, we rode in awkward silence. That is until out of nowhere, like we were about to be in a 10 car pile up, my elderly neighbor’s son shouted “THERE IT IS” pointing out our approaching exit (like I didn’t know that since I had been counting the mile markers for about the last 35 miles). Finally, we arrived back. I wished them a good visit and went home. What is it they say, no good deed goes unpunished? That may be true, but it wasn’t all bad. 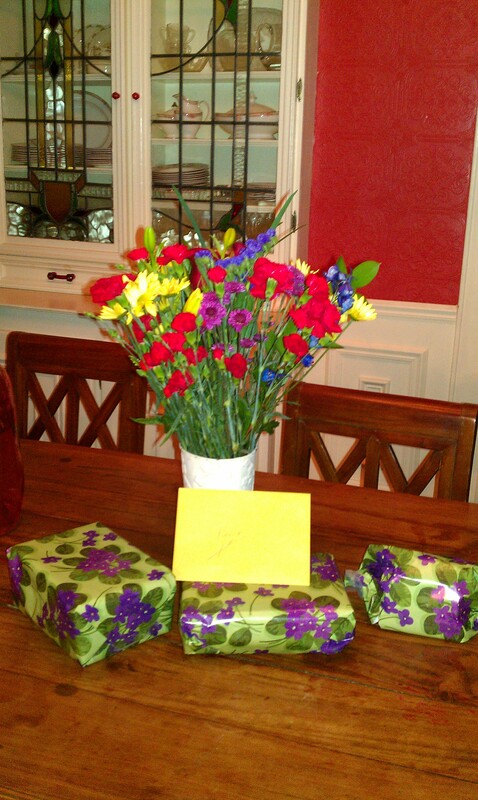 Flowers, presents, and a happy elderly neighbor… yeah, I suppose I came out alright, possibly even ahead. I just passed my 16 year mark too! Same schedule, its no wonder that I enjoy reading about your life… because its mine too. Awesome! Thanks for reading and commenting. Sneaky that one – Congrats – Here’s to the next Adventures Together:) Have a Lovely Weekend! Thank you! It wasn’t so bad after all! Great story! Your husband sounds sneaky in a good way. Happy anniversary! sneaky to be sure, but like you said, in a good way. Yeah, I guess I will keep him for another 16! Thanks for reading! That was so funny, I thought it was going to be something to have to do with baseball. Ha! Well, I do write about baseball, alot! I like that, I will have to remember to tell them that! We, too, are rarely in the same state on our anniversary or are traveling due to it falling on a holiday time, so I think this one took us off guard! Have a great weekend! Sounds like a contract worth renewing (that’s what I ask my husband every year – and we’re coming up on our 20th – ‘so honey, should we re-up again for another year? any needed changes to the contract?” He laughs but also tells me that he wonders when I’m going to realize I’m in this for the duration)…Happy Anniversary! I love that! Yes, definitely worth renewing! Well, you are more saintly than I – but at least I have my husband to get me into them every once in a while – it is good for me! Thank you! I may have already collected on that Karma!